Saturday morning Maddie and I went TCC to see Fletcher. We decided to take him for a walk. As we roamed the halls we ran into Mark Harmon and several of the 'celebrity' ball players. I will tell you I was very impressed with the way each and every one of those men smiled and greeted my Fletcher when they were introduced to him! As you all know, we have issues when we go out in public with Fletcher. People gawk and ask questions and these men were unfazed by Fletcher's appearance. That did my heart good and made me realize that these guys have a passion for TCC and the children who live there. Mark Harmon smiled at Fletcher and shook his little hand. It was sweet. Later that afternoon we went to the Mark Harmon ball game. They raised over $300,000! Thank you to everyone who came out and supported the TCC kids! 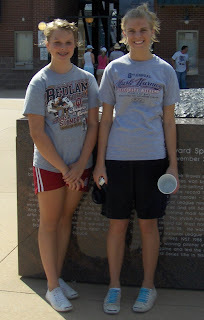 Kayleigh and her friend Paige walked around the stadium and we didn't see them until it was time to leave! 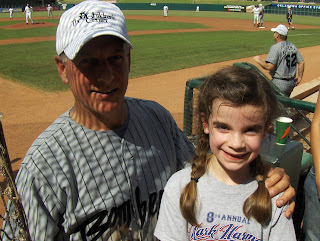 Maddie and I waited in line (man it was hot) so she could get Mark Harmon to sign the back of her shirt. He signed it last year and she wasn't leaving until he signed it this year. As we waited in the hot sun, I was wishing I had asked him to sign it on one of the occasions we ran into him that morning! Anyhoo, when he saw Maddie he said, 'Did you finish walking around the building?' I also had him sign a little baseball of Fletcher's. He was very gracious. I have to tell you a Maddie funny. As we were getting ready that morning she came into my bathroom and said she needed to floss her teeth. Well, let's be honest, she's not a big flosser if you know what I mean. So I said, 'Floss your teeth? Since when do you floss your teeth?' She said, 'Mommy, I want my teeth to look pretty for Mark Harmon!' She doesn't really get who he is. Until recently she's called him Mark Carmen! That girl is a hoot! Keep the videos coming! I love them! I am so proud of Fletcher!! We pray that he continues to improve and learn new things. 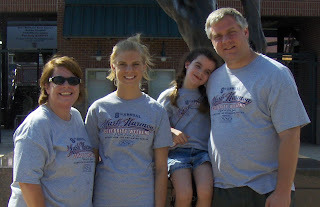 Several of us in Carsons extended family "check in" occasionally through your blog, we sure miss seeing Fletcher at the center! We really enjoyed the videos! Strength and peace be with you! God Bless you and your family! That is SO funny that she said that. It's so cool to see him on a video. I like this video thing. keep them coming!! I feel like I'm their with yall. Once again, he's adorable. I'm so happy that much money was raised for TCC!!! Great job. As you know, my Cooper has ENS and I hate the way people look. Even when they have the best intentions when I see them staring at his "birthmarks" it just breaks my heart. I love the video. He is doing so well and looks so happy.